Is User Generated Content the trend that delivers? For a generation that isn’t sold on brand loyalty, crowbarred brand stories or constantly changing trends, is user generated content (UGC) the way to truly attain engagement? A recent study suggests that 50% of millennials trust UGC more than other media, while 35% believe it is more memorable than other media. It seems that this style of content works like a snowball gathering pace, pulling more and more audiences into brand communities. There are some great brands using UGC for their marketing and brand awareness. Think Coca-Cola and their #shareacoke campaign. This personalised campaign gathered so much traction that it saw a 2% increase in sales, driving 100 million extra daily servings through 500,000 shared photos. The campaign was even able to claim Instagram’s most liked post with 5.6 million likes and counting, using Selena Gomez and a traditional personalised Coke bottle. Another brand at the forefront of the UGC generation is GoPro, whose marketing strategy is heavily reliant on this form of content. With around 6,000 videos posted online each day, GoPro has a plethora of content to play with. As Adam Dornbusch, GoPro’s Senior Director, states “We get users to submit content and are able to distribute it to as many people as we can over the world… They are using their [cameras to capture] their greatest passion.” UGC certainly works for GoPro, creating a community where everyone shares content, helping GoPro grow as a company and in its ability to reach further audiences. Here is the GroPro 2015 Year in Review shot completely on their product. Be a hero. To help them build further brand awareness, ice cream brand Magnum used UGC to propel their London summer campaign, focusing on the brands pop-up ‘Pleasure Store’ on South Molton Street. Magnum was able to gather significant data to back up the reach of UGC. 67% of the target audience were reached and 75% of UGC outperformed brand creative across attitudinal brand metrics, with more than 7,000 UGC photos in 60 days. Zoe Eungblut, Global Senior Digital Brand Manager at Magnum, echoes these stats by saying, “Consumer-generated images can perform better than our brand creative and can be considered a viable option for content assets to generate high engagement on site and drive repeat traffic.” I feel I can vouch for the reach of Magnums’ UGC, as it is something that persuaded me to visit Magnum’s Pleasure Store myself. 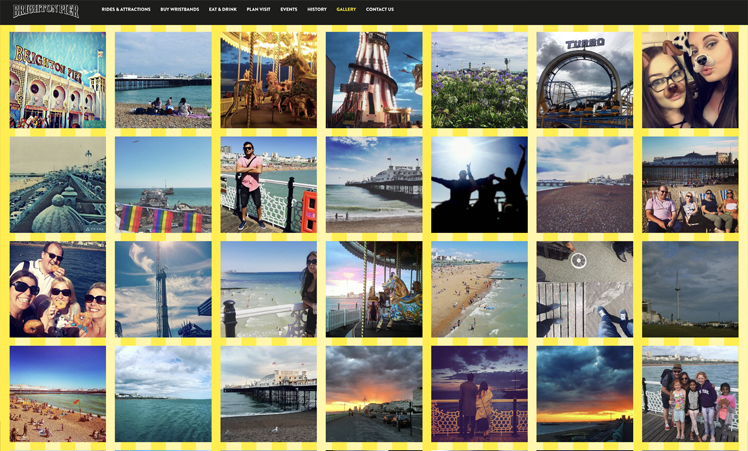 At Underscore, we found user generated content to significantly increase engagement as part of our social media strategy for Brighton Pier. In the immersion stage of our project, findings showed that #brightonpier generated over 110,000 posts on Instagram, so we’ve shaped our social media strategy around utilising this content and incentivising the audience. By implementing a content plan that is 70% UGC driven, we have increased engagement rates by 363% on Instagram and reach by 481% on Facebook, generating over 11 million monthly impressions. So why is it that user generated content is so engaging? The answer is simple… From a consumer point of view, it is instantly relatable to you. You can see those moments, those experiences, and put yourself there. Meanwhile, for a brand UGC gives the customer the opportunity to create their own story, which brands can then utilise to build their communities. Brand engagement with UGC can also incentivise the audience, which encourages sharing and allows brands to further amplify their reach.